Mohammed A. Bamyeh discusses the currents and contradictions within the revolutionary movements sweeping the Arab world, and their ultimate potential. The Arab spring, as far as we can see, appears to require no guardian intellectual authority, no political leadership, no organized parties. In fact even after revolutionary success, those elements still fail to materialize: there is no party of the revolution anywhere, no leader emerges to embody its historical spirit, and intellectuals still ponder the meaning of revolutions that most of them endorsed but none expected. Furthermore, these apparent absences—political, organizational, intellectual--were not due to any unfamiliarity with parties, leaders, ideologues or ideologies of revolt, for all of those have been tried before. A revolution is an experiment in enlightenment. Experiments, as we know, may succeed, fail, or suggest revisions in their method, sometimes a reconsideration of what they are supposed to discover. 19th century revolutionary thought in Europe is often traced to the Enlightenment critique of the arbitrariness of absolute power, and to the Enlightenment's elaboration of the creative capacity of human will, reason, and freedom. Since these philosophical propositions were social in their implications, they could only be verified (or amended, or abandoned) only with the aid of grand experiments in the political, cultural and economic realms. Those experiments have followed different techniques. In reflecting on the Arab revolts underway I would like to propose three basic techniques of enlightenment. 1) An authoritarian technique, in which an enlightened elite, using the state, takes it upon itself to modernize an immobile, unruly mass presumed to be governed by arcane traditions; 2) a liberal technique, in which a modern state is seen to be crucial, but its elite is neither presumed to have monopoly over enlightenment nor power to make such a claim; 3) an anarchist technique, in which enlightenment is seen to come most reliably from below, through transformations of civic traditions rather than through state power or social engineering. The common presumption that enlightenment has generated an alliance of knowledge and power describes in fact only one of those three techniques, namely the liberal technique, in which knowledge complements the otherwise partial power of the state. Knowledge here organizes a civic link between state and society, and in the process reduces for the liberal order the costs of policing and repressive needs. The two other techniques, by contrast, tend to set power and knowledge as substitutes rather than allies. The more authoritarian techniques are premised on the presumption that power is the best means to accomplish any goal, the less need there is for knowledge, since power alone will do. Whereas in anarchist techniques, suspicion of the merit of power as means to ends, highlights the compensatory value of knowledge alone as the best means. In the current Arab context, revolutions are the means of testing, again, the philosophical propositions of the Enlightenment. As such, these revolutions constitute part of the Enlightenment's ongoing global history. They are certainly not the first encounter by the Arabs of Enlightenment propositions; the story of such propositions themselves is indeed very old, and much of their underlying bases can in fact be found in indigenous philosophical and social traditions, rather than simply as recent importations from Europe. As critiques of despotism, as enactments of popular will, as acts of liberation, as progressive demolitions of frozen reality, these revolutions express the failure of an earlier, authoritarian experiment. From a contemporary revolutionary perspective it is easy enough to recognize the two basic failures of the now exhausted authoritarian path to enlightenment: 1) that path has more magnified the authoritarian than the enlightened aspect of the state; 2) the authoritarian path hid from view a crucial social fact being asserted now openly in Arab streets everywhere, namely that enlightenment comes from below, not from above; that society has already become far more saturated with ethos of enlightenment than has its government. The Arab revolutionary experiments seem to be based on the newly shared presumption that ordinary individuals are capable of enlightenment without leadership or guardianship, without even organizations in the common sense of the word; that their enlightenment entitles them to undo the tyrannies under which they have languished in recent decades; and that acts of enlightenment are practical and not simply contemplative, world transformative rather than narrowly pragmatic. The agent of this revolutionary enlightenment is the little person, not the historical figure, the hero or the savior. It is in this sense that the current Arab revolutionary wave is closest to anarchist ideals, which highlight spontaneous order and posit the principle of unimposed order as the highest form of a rational society, and which like all revolutionary currents in 19th century Europe had clear roots in Enlightenment thought. Obviously, few of the current Arab revolutionaries call them "anarchists." And in any case, none of the revolutions so far intend to replace the state itself with a self-governed civic order, only to modernize the state so that it respects citizen's rights and becomes more accountable. Thus in these revolutionary experiments we encounter a rare combination of an anarchist method and a liberal intention: the revolutionary style is anarchist, in the sense that it requires little organization, leadership, or even coordination; tends to be suspicious of parties and hierarchies even after revolutionary success; and relies on spontaneity, minimal planning, local initiative, and individual will much more than on any other factors. On the other hand, the explicit goal of all Arab revolutions is the establishment of a liberal state—explicitly, a civic state--not an anarchist society. It is not unusual in revolutionary histories for revolutions to produce an unintended result. Max Weber already suggested that such disjuncture between the intention and result of revolutions was inevitable, when in the midst of the 1919 revolution he gave his famous lecture Politik als Beruf. But in the case of the Arab spring, we witness a rare likelihood that revolutions are reaching precisely their intentions: even governing orders now agree openly with virtually all revolutionary demands, except moving out of the way of the revolution. The intention is so widely shared in society, and so simple, that no organization at all is required to express it. 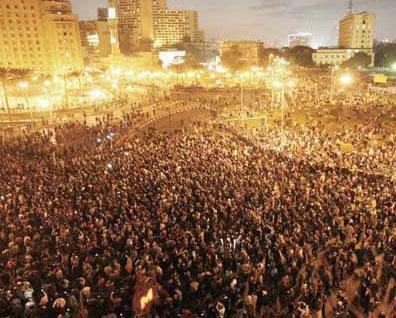 A revolution here is an expression of social consensus: consensus on both method and intention. The liberal outcome is promised precisely by the anarchist method. Neither is a product of any party plan, but both are the foundation of the social consensus out of which the revolutions are emerging. So here the entire revolution is rational, from beginning to end, since intention and result seem to cohere, even though method (anarchy) and theory (liberal) appear to have no connection at all. Yet they are connected, in the sense that both anarchism and liberalism are part of the heritage of the enlightenment and describe different dimensions of it. They do so not because they had been described as such in enlightenment thought, but because their communion expresses older social realities, which we would not suspect if we confine our perspective to European history. In Islamic history, for example, what would later be called "anarchism" or "liberalism" occasioned old realities in which a substantial part of the civic order either lived independently of the state or generated serious limits to the reach of the state in society. Elements of that old civic order appear to have sustained themselves even after, in the name of the enlightenment, modern, authoritarian states devoted all their resources to magnifying state power over society. Yet, the persistence of elements of the old civic ethics can be evidenced in revolutionary styles themselves: spontaneity of the revolutions is an extension of the already familiar spontaneity of everyday life; revolutionary solidarity, out of which emerges the will to sacrifice and combat, is an extension of common, convivial solidarity in neighborhoods and towns; distrust of distant authorities is part of an old, rational and enlightened common attitude, based on the simple thesis that a claim to help or guide is unverifiable in proportion to the power and distance of the authority that makes it; and finally, non-violence as a strategy is not learned out of manual written at Harvard, but out of familiar and old habits of protest. In recent years, we were made to forget the ordinary salience of those habits, as our attention was galvanized by spectacles of "terror" and "counter-terror" (a game with no political result other than feeding the power hunger of the authoritarian order and serving as its last raison d'etre). The crumbling authoritarian enlightenment, with its vanguardist and paternalist propositions, lies in a number of dynamics: vanguardism, as we already knew from Frantz Fanon, often expressed lack of knowledge by the vanguard, who eventually become ruling elites, of their own society. In its later phase, vangardism became pure paternalism: distance of governing elites from the people became lack of interest in knowing the people. Amidst this disinterest the old vanguardist authoritarianism is expunged of its anti-colonial, progressive, Third Worldist claims; and out of its ashes there emerges a cold, paternal authoritarianism, disinterested in any form of peoplehood, and governed openly by an avowed marriage of business and state elites. Enlightenment as a goal could be approached using different techniques. In the grand revolutions of the Arab spring, the liberal interpretation of the enlightenment fights an authoritarian interpretation, with the aid of an anarchist method--that is to say, with the aid of familiar civic traditions, now discovered again to be natural venues for expressing the organic and embedded nature of the enlightenment. This is why these revolts are entirely against the authoritarian state, but not against any old cultural tradition. The liberal state that is now on the horizon is not the end of the story. Revolutions themselves establish new traditions. They provide a grand reservoir of memory of what is possible, and that memory tends to be employed in future contests. In the final analysis, the state itself is neither the most rational vehicle of any enlightenment nor even its necessary goal. But now that the authoritarian enlightenment is being demolished, enlightenment becomes everyone's project. The expectation from a liberal political order is that the citizen has enough breathing room outside the tutelage of the state, so as to overcome one's own "self-imposed immaturity," as Kant famously defined the condition of enlightenment. But in the revolutionary processes themselves one demonstrates an accomplishment that required only a revolution to be experimentally verified: in overcoming not one's own but state-imposed immaturity, one demonstrates that the overcoming of a self-imposed immaturity has already taken place, inaudibly, and long before any revolution. The method of the revolution itself verifies the propositions of the enlightenment, now taken to earth and entrusted to ordinary mortals, directly.